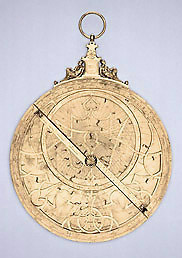 This astrolabe is, by any standards, an exceptionally fine if not untypical piece of craftsmanship from the renowned Arsenius workshop of Louvain. Close inspection, however, reveals a number of flaws in its execution: several words on both sides of the mater and plate have been wrongly engraved and rather crudely corrected, and the throne (in which the woodland deities faunus and fauna support a heraldic centrepiece rather than the compass more usual for Arsenius) bears holes in its casting. Although the instrument, along with three other surviving astrolabes, is explicitly signed by Regnerus Arsenius, controversy still surrounds whether this maker is one and the same as Gualterus Arsenius, the founder of the Arsenius workshop, or a close relative or associate.